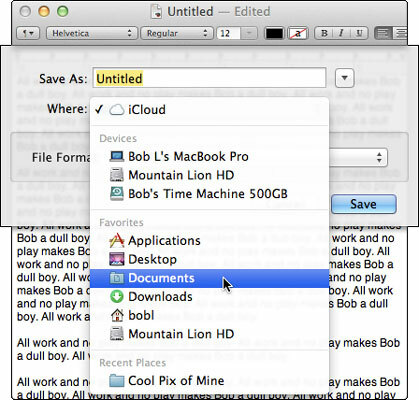 When you choose to save a file in Mac OS X Mountain Lion for the first time (by choosing File→Save or pressing Command+S), a Save sheet appears in front of the document that you’re saving. This is the basic Save sheet. 1In the Save As field, type a name for your file. When a Save sheet appears for the first time, the Save As field is active and displays the name of the document. The document name (usually, Untitled) is selected; when you begin typing, the name disappears and is replaced by the name you type. 2If the Where pop-up menu lists the location where you want to save your file, choose that location, and proceed to Step 5; if not, click the disclosure button (the one with the little triangle to the right of the word Untitled). You can choose from a short list of folders and volumes listed in the basic Save sheet’s Where pop-up menu (which are the same devices and favorites you see in the Sidebar of Finder windows). Or, if you click the disclosure button (triangle), the sheet expands so that you can navigate folders just as you would in the Finder: by opening them to see their contents. 3To find the folder where you want to save your file, choose among views by clicking the Icon, List, Column, or Cover Flow view button. The buttons look like their counterparts in Finder windows. In icon view, you double-click a folder to open it. List and Cover Flow views offer disclosure triangles for folders and disks, so single-click the disclosure triangles of folders to see their contents. In column view, you click an item on the left to see its contents on the right, just as you do in a column-view Finder window. You can also use the Forward and Back buttons or the Sidebar, both available only in an expanded Save dialog, to conveniently navigate your disk. Many of these navigation aids work just like the ones in the Finder. 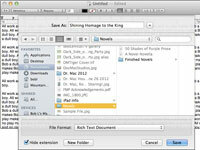 4Select the folder where you want to save your file in the Where pop-up menu or Sidebar. If you can’t find the folder in which you want to save your document, type the folder’s name in the Search box. It works just like the Search box in a Finder window. 5If you want to create a new subfolder of the selected folder to save your file in, click the New Folder button, give the new folder a name, and then save your file in it. 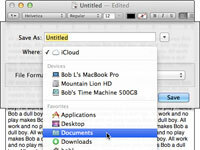 The keyboard shortcut for New Folder is Shift+Command+N, regardless of whether you’re in a Save sheet or the Finder. 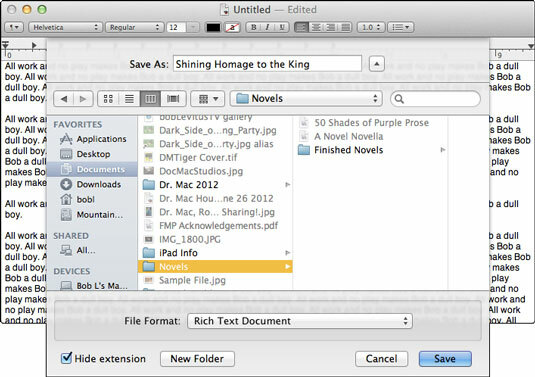 To create a new folder inside the Novels folder, you could click the New Folder button or press the shortcut. 6In the File Format pop-up menu, make sure the format selected is the one you want. If you want to turn off the display of file extensions (such as .rtf, .pdf, and .txt) in Save sheets, select the Hide Extension check box. 7Double-check the Where pop-up menu one last time to make sure that the correct folder is selected; then click the Save button to save the file to the active folder. If you click Save, the file appears in the folder you selected. If you change your mind about saving this file, clicking Cancel dismisses the Save sheet without saving anything anywhere. In other words, the Cancel button returns things to the way they were before you displayed the Save sheet.